If you've been paying attention, you know that river cruising has become immensely popular. Why? Because it's an easy, comfortable, affordable, and romantic way to sample multiple destinations and their top sights, and with never a worry about seasickness. River cruising got its foothold in Europe where for eons, rivers have been routes for commerce connecting Europe's most historic and beautiful cities. We've had the pleasure of cruising rivers in other regions—namely Egypt's Nile and the Amazon of Brazil—but our favorite is still Europe, where so many options exist. This fall, we chose to cruise with A-Rosa CruisesTHC, a German-owned line new to the American market, in a destination that's still up and coming for Europe, the Rhône and Saône rivers of southeastern France. We met the A-Rosa Stella in Lyon, France's third-largest city, which sits at the intersection of both rivers. Lyon is considered the culinary capital of France and is a surprisingly interesting and beautiful city. The cruise started and finished here and made an in-between visit as well, so we had plenty of time to explore it—but more about that in my future Hideaways Life article. 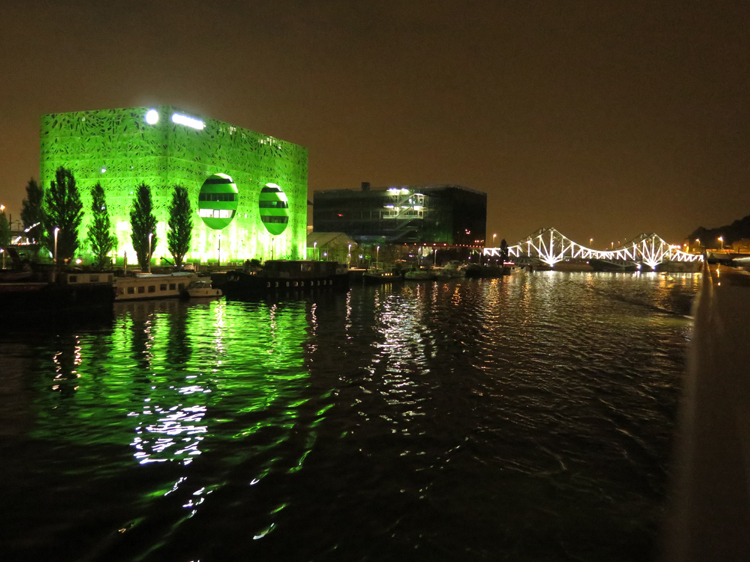 Our cruise set out at dusk, a magical time when Lyon could certainly compete with Paris for the title "City of Lights," as the façades of all its beautiful buildings and its many bridges are awash in lights. It was quite a spectacle and a most romantic experience viewed from the top deck as we cruised down the Rhône, took a right turn, and headed up the Saône to Burgundy wine country. That evening, we settled into our comfortable and reasonably spacious cabin with its well-designed en-suite bath. We were impressed by the amount of storage space, his-and-hers closets, and the French balcony with sliders that gave us a commanding view of the passing scene. Cocktail hour was in a spacious lounge over the bow, with wrap-around windows. A-Rosa has an open-bar policy throughout the day, so there was no signing for drinks. Most meals aboard A-Rosa ships are served buffet style with a nice number of selections. A-Rosa ships do offer a separate sit-down dining experience, which we tried once and found quite good. In 2016, fares will include four evenings of gourmet dining by reservation, and A-Rosa has indicated that its cuisine will be angled to reflect the areas in which it's cruising. Some of the amenities A-Rosa offers are a very spacious top deck with a pool and games—boules, an oversized chess board, and, of course, shuffleboard—which would have been more enjoyable in summer than during the cool weather we encountered in October. And, unfortunately, we never found time to enjoy the big sauna that offered a water-level view as we cruised along or the various treatments offered in the spa. One drawback to the A-Rosa experience was that guests were predominantly German-speaking, so opportunities for socializing and camaraderie were few because of the language barrier. Also, the local guides imparted their wisdom in German first, meaning we had to wait for the English translation before understanding what we were seeing. A-Rosa is actively marketing toward more English-speaking regions like Australia and Great Britain, so this may not be such an issue in the near future. That said, the next few days of cruising along the Saône were very pleasant and found us exploring two quaint towns in the Beaujolais wine region, Mâcon and Chalon-sur-Saône. The cruise offered excursions to the famous nearby abbey town of Cluny and to Dijon, capital of the Burgundy region and famous for its mustard and gastronomy. However, we decided to strike out on our own to explore Mâcon and Chalon-sur-Saône, whose histories date back to Roman times. Both offered vintage houses, elegant churches, and government buildings all lining narrow cobbled streets, along with surprisingly good art galleries and museums. We did visit Châteauneuf du Pape, the most famous appellation of the Rhône wine district, stopping at one of its famous vineyards for some education on the art and science of wine making and to taste some of its wares. But our favorite port was Avignon, the ancient walled city on the banks of the Rhône that was once the seat of the pope and the center of Christianity. The Pope's Palace is worth an afternoon in itself, offering an excellent audio guide that allows you to explore at your own pace. The town, if a bit touristy, is certainly atmospheric and fun to wander around. We came away from our A-Rosa cruise relaxed and with a good feel for the region we had traveled through—certainly two of the main reasons for river cruising. A-Rosa offers cruises on a wide range of Europe's most popular rivers. It does not bill itself as luxurious but rather as a value-oriented, all-inclusive premium river cruise option, and we'd agree with that assessment.